Earlier this week, Texas firefighter Tim Conatser thought it would be an absolutely brilliant idea to post a picture of two dogs on his property that he had allegedly just killed. 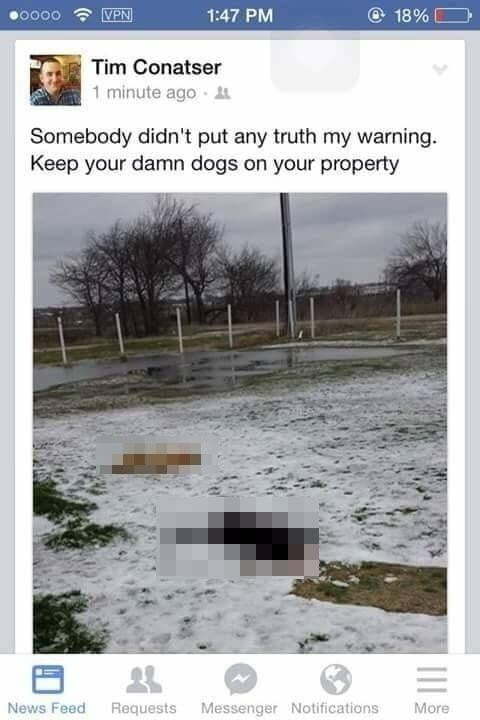 The picture (censored below) shows two dogs, one tan and one black, lying in blood-stained snow. Along with the picture, Conatser wrote “Somebody didn’t put any truth my warning. Keep your damn dogs on your property.” Within hours, the picture went viral on the social network and Internet outrage ensued. Soon after the photo went viral, the Union Valley Fire Department in Texas cut ties with Conatser and removed the agency’s Facebook page due to the overwhelming response. Hunt County officials have confirmed that an investigation has been opened into the killing of the animals. In addition, the SPCA of Texas is working with Hunt County on the investigation. According to a report on a local CBS affiliate, family friend Kevin Forester indicated that Conatser had trouble with the dogs prior to this incident. Specifically, the two dogs has gotten into Conatser’s barn and were harassing the animals inside. According to Forester, Conatser went to the owner of the dogs to complain, but the owner continued to allow the dogs to roam free. In Texas, there’s a state statute that allows an animal owner to defend their livestock from dog or coyote attacks. However, it’s not clear that the dogs were attacking livestock during the shooting.